Southend Aerodrome Reopens - Post wartime requisition, RAF Rochford was returned back into civilian hands in August. 1947 also saw something Southend would become much famous for in later years as in it's new hands the aerodrome hosted an international Air Rally. New Yacht Club Formed - The Thames Estuary Yacht Club came to life in 1947, although not so new as it came about through an amalgamation of Nore and Westcliff Yacht Clubs. The Nore Club suffered a direct hit by a bomb during the war. While the Westcliff's HQ ship, Middlesex II, was laid up on Leigh Marshes. The works needed to return this back to use was beyond the club. Industrial 'Progress' - In the post war climate Southend Council was keen to improve economic development in Southend. 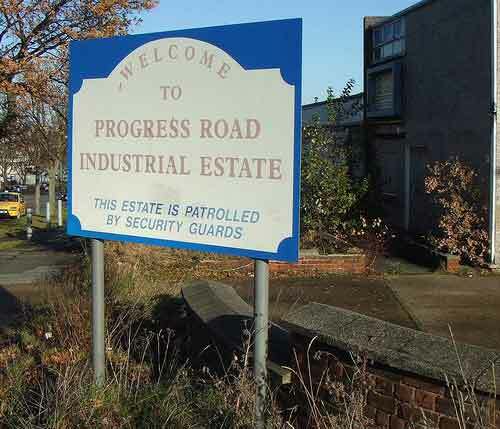 1947 saw Progress Road being built off the A127, close to the town's bor der; and the seeds were planted for the borough's first industrial estate. Which in it's time has hosted some of the town's most important employers including PMS, MK Electric and JEGS. This site is still considered to be very important in the town's future business plans. Wakering Wants to Join - Great Wakering applied to become part of the Borough of Southend-on-Sea in 1947, but nothing came of it. Films International - The Civic News Theatre in the complex of the Talmage buildings began a rare treat for international film lovers care of the Southend Film Society the very best of British, Russian and French films were shown in March 1947. Old Leigh Under Threat - The authority at this time wanting to improve access to Southend w as keen to flatten Old Leigh to allow a a new Western Approach road to be built. Fortunately, enough public opposition stopped this plan moving forward and retaining Old Leigh and its charm to be enjoyed for the future. Lapwater Hall Demolished - November 1947 the demolishers took away a fine building that stood on the London Road, between Hadleigh Road and Burnham Road. Originally called Leigh Park House, a house dating back as far as 1750 when then it had almost fallen to a ruin, but was saved when sold to a Master Builder called Gilbert Craddock, who later turned out to be a renouned Highwayman Cutter Lynch. Official opening in October of the Southend Hospital extensions by HRH the Duchess of Kent. Art Gallery - After the setting up of the Art Gallery Sub-Committee of the Public Libraries & Museum Committee in 1928, it finally came to pass this year that Mr Walter G Beecroft, solicitor of Leigh, offered to endow a building in Chalkwell Park as an Art Gallery and Cultural Centre. This was accepted by the Council, and it was intended to establish "The Beecroft Art Gallery" in Chalkwell Hall. This later was to be homed in a building on Station Road. First Industrial Exhibition - Southend's Chamber of Trade needing to raise aspirations post war held the first Industrial `SOUTHEND and District Can Make it' exhibition, held at the Municipal College in the town from 12th to 19th April. Then 25 manufacturing businesses took part.